If the thought of starting an eCommerce website from scratch makes your head spin, wireframing is one way to ease your worry. Learning how to wireframe a website allows you to strategically plan your site, providing much needed organization and a solid plan of action. Think of wireframing as a blueprint: it outlines where your headers, body content, and other design elements will be placed on the site. With the aid of free wireframe online tools or wireframe prototype software, your task will become even easier. The hierarchy of your information, from headers and body content to footers. Your wireframe determines the priority of information on your site, such as which themes or pages will serve as the top headers on drop-down menus. How the user will interact with the website, including where and when they will use certain menus. Wireframing should take into account different scenarios, such as the multiple ways a customer might make her way through the purchase cycle. Which features, such as social media icons, need to be on your website and where they will be positioned. Where the professional pictures for your website and other visual elements will be placed in relation to text and other graphics. The primary purpose of creating wireframes for websites is to facilitate an organized, reasonable process for building the website. Most wireframes for eCommerce sites begin as black and white, two-dimensional drawings or constructs. This rudimentary outline of your website not only provides a general vision for its creation, but also helps you to determine which future tasks are required to build the site to completion. The site planning and wireframing stage of your web design also allows you to craft the ideal user experience. How will visitors add items to their shopping cart? What will the flow of the user experience look like? Staging a wireframe is vital to an eCommerce site, because frustrated website visitors are less likely to convert to buyers. Your wireframe determines where site content will be, which is another important element for creating a positive user experience. Item descriptions, pricing information, and product reviews are just some of the content that will go on your eCommerce website blueprints that relate to user experience. 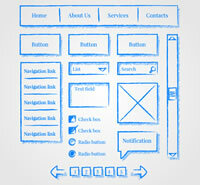 Call to action elements, or CTAs, should always be included on a wireframe. Whether you assemble your wireframe using website wireframe software or another tool, it is vital to figure out how each CTA will be positioned on your website. A well-placed “Purchase” button can make the different between a user navigating away versus converting into a buyer. During the wireframe process, ask yourself: “What do I want users to do on the home page?,” “Which step do I want them to take first?,” and other relevant questions. The answers to these questions will make it easier to indicate on your wireframe where CTA buttons and links should be placed. When creating an eCommerce site plan and wireframe, always keep the experience of your user in mind. Before you get carried away with colors, styles, and other branding decisions, make certain the basic flow of information on your site is easy to follow and calls to action are in place. The good news about wireframing is that it makes creating an eCommerce site a bit less hectic. The best news is that one of the top 10 website builders for eCommerce websites can offer easy to edit templates that streamline the site planning process. To learn more, compare eCommerce website builders now.